This idioms worksheets page contains exercises and worksheets all about learning and using English idioms. You can do the idiom exercises from this page or download them as some worksheets that you can print and do at home. These are the worksheets from Excellent ESL 4U that are all about idioms. Just click on each link to download them. The best way to learn anything is by doing it or using it. So the best way to learn idioms is by using them yourself. This page and the idioms worksheets from it will let you practice using the 50 idiom examples that are presented on this site. You should start by look in at the idioms from the idiom examples page, which have also been made into an idioms examples worksheet that you can download. Look at these and see what they are and how they have been used in the examples shown for each idiom on the worksheet. Then you should try to do the exercises on this page and the idioms worksheets from it to practice using the idioms. Each area has two exercises for you to do. In this exercise you need to decide which option (A-D) in each question has the correct definition or meaning of the idiom given in the question. Use the get score button to see how many you got correct after you have answered all five questions. Chose the correct definition for the idiom in this quiz. 1) What is the definition of Look out for number one? A) To have difficulty doing something, or to experience a difficult period. B) To help someone with something. C) To do something so that you will get all the benefit. D) To be difficult to find, or to be very isolated and remote. 2) What is the definition of Lick your wounds? A) To swear a lot. B) To go away and recover from a bad experience or defeat. C) A way to ask someone what they are thinking about. D) To start to do something before all the preparation has been finished. 3) What is the definition of Have a blast? A) To tell someone to be polite and to use good manners. B) Something that you find very easy to do. C) To say that it is someone else’s responsibility to make a decision or do something. D) To have a very good time. 4) What is the definition of Stand on ceremony? A) To expect that everything is done in the proper and very formal way. B) To finish something or to give it away so that it is no longer your responsibility. C) To say that having different experiences makes life fun and interesting. D) To do something slowly. 5) What is the definition of Don't know the first thing about it? A) To have no knowledge about something. B) The time that you can no longer change your mind, or when you have to do what you are doing now. C) To use all your strength and ability to achieve something, or to be in very vicious combat. D) To say you will deal with a problem when you need to and not before. In the second vocabulary idioms exercise you need to decide which idiom (A-D) matches the definition or meaning given in each question. Once you have finished you can use the get score button to see how well you did. Chose the idiom that matches the definition given in each of the five questions in this quiz. 1) What is the meaning of the following definition: To say that it is easy to claim you will do something but what you really do is all that matters? 2) What is the meaning of the following definition: A phrase to say when something that is illegal has been found and is being stopped? 3) What is the meaning of the following definition: To make a mistake? 4) What is the meaning of the following definition: To be able to afford many expensive things? 5) What is the meaning of the following definition: To mean something full and with all your ability? You can download the vocabulary idioms worksheet by clicking the following picture or link. For the first idioms listening exercise you need to listen to the following recording and then answer the questions. 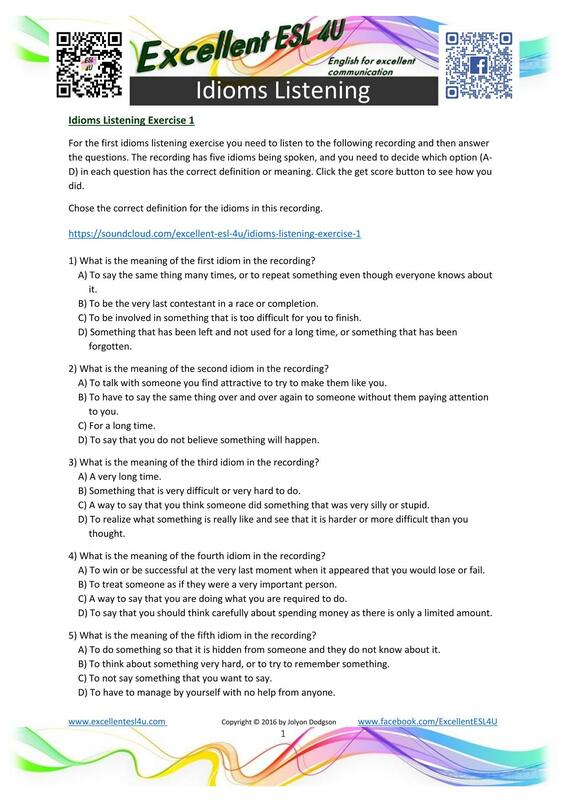 The recording has five idioms being spoken, and you need to decide which option (A-D) in each question has the correct definition or meaning. Click the get score button to see how you did. Chose the correct definition for the idioms in this recording. 1) What is the meaning of the first idiom in the recording? A) To say the same thing many times, or to repeat something even though everyone knows about it. B) To be the very last contestant in a race or completion. C) To be involved in something that is too difficult for you to finish. D) Something that has been left and not used for a long time, or something that has been forgotten. 2) What is the meaning of the second idiom in the recording? A) To talk with someone you find attractive to try to make them like you. B) To have to say the same thing over and over again to someone without them paying attention to you. C) For a long time. D) To say that you do not believe something will happen. 3) What is the meaning of the third idiom in the recording? A) A very long time. B) Something that is very difficult or very hard to do. C) A way to say that you think someone did something that was very silly or stupid. D) To realize what something is really like and see that it is harder or more difficult than you thought. 4) What is the meaning of the fourth idiom in the recording? A) To win or be successful at the very last moment when it appeared that you would lose or fail. B) To treat someone as if they were a very important person. C) A way to say that you are doing what you are required to do. D) To say that you should think carefully about spending money as there is only a limited amount. 5) What is the meaning of the fifth idiom in the recording? A) To do something so that it is hidden from someone and they do not know about it. B) To think about something very hard, or to try to remember something. C) To not say something that you want to say. D) To have to manage by yourself with no help from anyone. In this activity you again need to listen to the following recording, but this time the definitions of the idioms have been recorded. Then chose the option (A-D) that has the idiom that matches the definition. See you score by using the get score button. Chose the idiom that matches the definitions given in the recording. 1) What is the meaning of the first idiom definition in the recording? 2) What is the meaning of the second idiom definition in the recording? 3) What is the meaning of the third idiom definition in the recording? 4) What is the meaning of the fourth idiom definition in the recording? 5) What is the meaning of the fifth idiom definition in the recording? 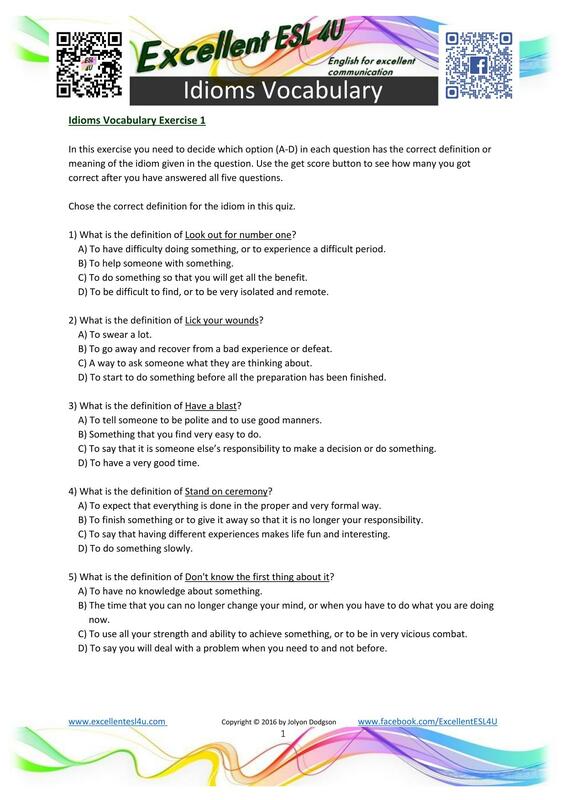 You can download the listening idioms worksheet by clicking the following picture or link. For the first idioms writing exercise you have to write about one of the following three topics by using as many idioms as possible. Try to write as much as you can, use full sentences, and have several paragraphs. Remember to change the form of the idiom so that it fits grammatically into your sentences. Once you have finished writing about the first topic, you can try to write about the others if you really want to have lots of practice. Describe something that has gone wrong while working in an office. Describe what might happen when a person is trying to get a new girlfriend/boyfriend at a bar. For the second idioms writing task you have two role-play situations, and you need to decide what the people would say to each other. The participants in the role-play should use as many idioms as possible. Try to write as much as you can. Then when you have finished you can try to perform your role-play with a friend to get experience of speaking as well. Situation: At a football match taking about how the teams are playing. Location: In the stands in a football stadium. Situation: Teachers are describing some new students and what they are like. Participants: Two or more teachers. 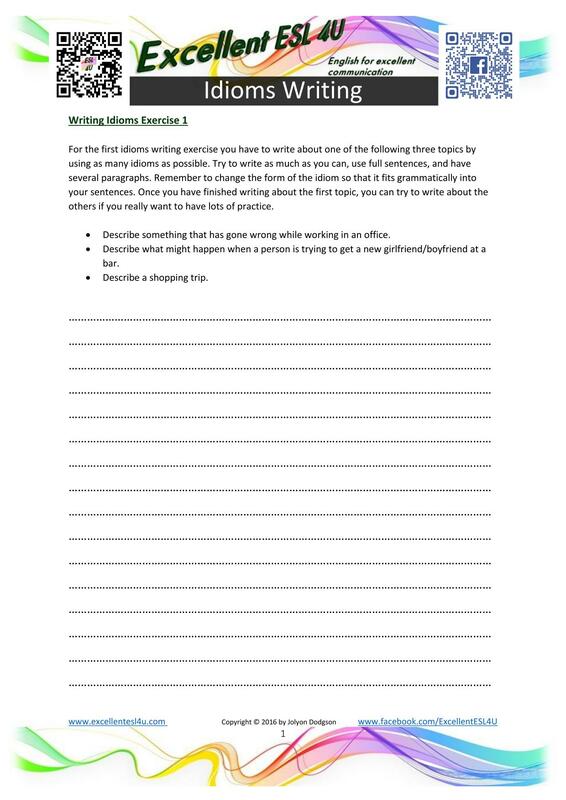 You can download the writing idioms worksheet by clicking the following picture or link.